← How much is worth Mozilla browsers loyalty to Google? $300 million per year! 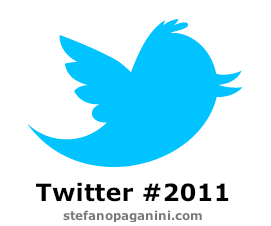 2011: a video summary of the whole year as seen through Twitter – and the growth of Twitter itself too! Jeremiah Warren. has come up with a brilliant round up of the biggest stories in 2011 via Twitter. If 2011 is to be considered the year of Social Media, Twitter is, for sure, the star of all Social Networks. Most conventional media, TV and newspapers, relied on Twitter to tell most of the events that occurred in 2011 – often gasping while late, compared to the blazing speed of Tweets. This entry was posted in Brand, Case Study, Digital life, Digital media, Digital video, History, Media, News, Social initiatives, Social Life, Social marketing, Social Media, Social network, Social news, Social survey, Tech industry, User Engagement, Video, Youtube and tagged 2011, Bit.ly, Media, social media, Social media strategy, Social news, Tweets, Twitter, Twitter and Media. Bookmark the permalink.